Home » Programs » Internships » Intern Blogs » Week 1: Welcome to D.C.
Week 1: Welcome to D.C.
After almost 11 hours of fights, layovers and traffic, I finally arrived at my new home at George Washington University. All 14 of the SPS interns share a giant suite type dorm, with two students per room. The interns are spread out amongst various places and topics, and I am thankful that we all live together because we can share our unique experiences regularly. This is my first time in D.C. and so far I am having a blast. Coming from a small town, the sheer amount of people will take a little bit to adjust to. That and the unbelievable traffic. The city is beautiful and very accessible, and after a short learning curve the metro system is quite wonderful. 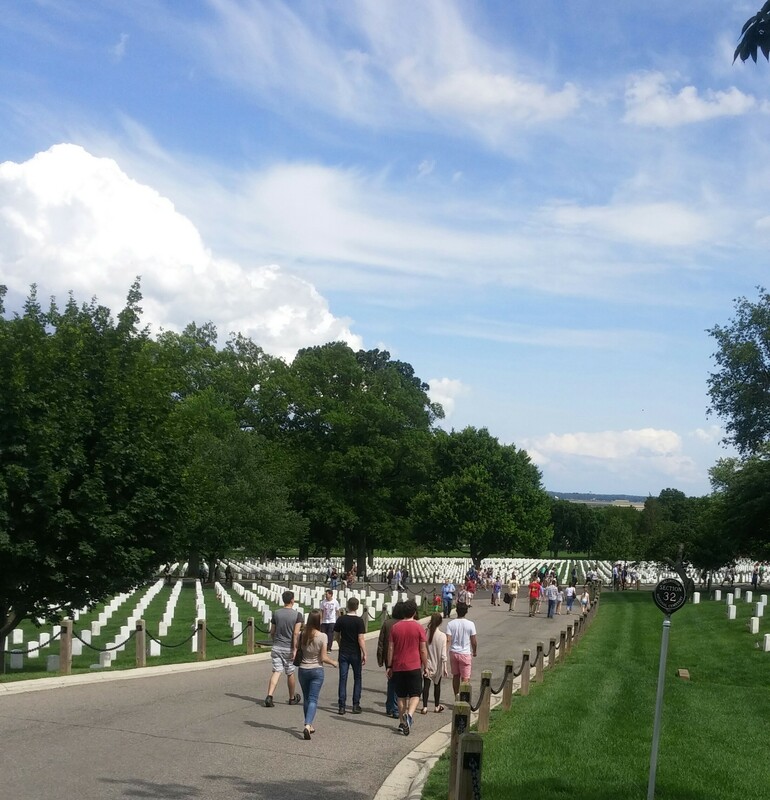 Once the majority of us were acquainted and settled in, we went to Arlington National Cemetery on Memorial Day. It was humbling to see all the graves of those who have served our country, and the somber respect was palpable. It was quite an experience, especially being my first time there. Not only is D.C. a historical and political hub, it is also a great place for food. So far I have had Thai food for the very first time, and had sushi for the second time in my life. Both of which were dangerously good, and I will probably become addicted by the end of the summer. Apparently the brunch and breakfast selections here are phenomenal and being the breakfast connoisseur that I am, will take plenty of time test that out. This week consisted of meeting everyone, peers and mentors, which started off with a day of orientation. Here we got to meet the wonderful people of AIP and were given a run-down of how the summer will play out. This summer I will be work at NASA studying the Cosmic Microwave Background (CMB) and this week I was tasked with settling on a project. I thoroughly enjoyed the fact that I was given many options and had the freedom to pursue what I thought would suit me best. I did indeed settle on a project, and will be designing and testing an infrared filter. I extremely excited to work on this project because of the vast amount of new skills I will acquire, and because of the brilliant people I will be working with. Week 2: And So It Begins!